PCR is used regularly in all areas of science, including molecular biology, clinical diagnostics, forensic science, environmental science and food science. When it comes to PCR sample preparation and isolation of RNA, DNA, and proteins, PRO Scientific rotor stator homogenizers are an ideal physical method used to disrupt the sample in both soft and tough tissues. Our standard PRO rotor-stator homogenizer generator probes are precision crafted with a very narrow clearance between the inner rotating shaft and outer tube/chamber. This allows for quick, effective and repetitive processing, meaning you will get the results you want each and every time. Their 316SS and PTFE construction make them chemically compatible with most reagents, including Trizol. And the variable speed of our homogenizers allows for the utmost control of your homogenization to ensure a high yield and fragment size. When the concern of preventing cross-contamination between samples arises, our multi-sample homogenizing systems such as the Multi-Gen 7XL, DPS-20 and Multi-Prep ensure sample purity while still being compatible with various reagents on the market. 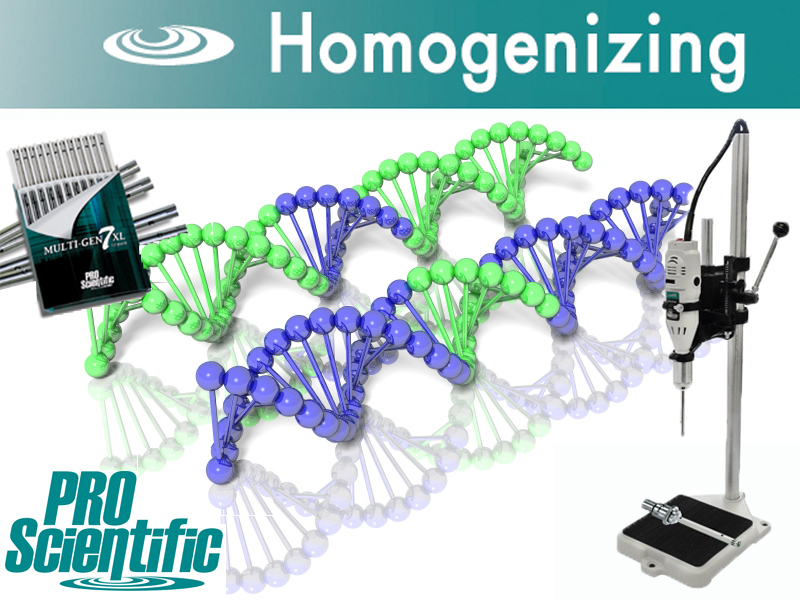 The Multi-Gen 7XL Homogenizing Package is the perfect PCR Homogenizing Kit.